You will be able to use and enjoy the valuable benefits of having your own kool website. You can give your site address to others and they will be able to go directly to your site and enjoy what it's all about! It's more Fun and Better than writing and having a Book or Novel published and sold at some book stores... And MOST IMPORTANTLY, you will have COMPLETE Control of your page design, and be able to make changes to it yourself whenever you want (in real time) from your own PC!... (can't do that with a Book that you wrote and published)... And not to mention, it's all FREE!!! no Books, CD's, Tutors, Paying a Design Company or Going to a Costly College are required!!! Just your Desire, Time and Patience... are all you really need here! Everything is available Online! Make No Mistake About This... here you will learn how to actually build web pages yourself, using a text editor on your PC (and "publish" them to the Internet... becoming a Real Live Web Author), from SCRATCH... unlike many free Blog Sites or Free Page Builders or HTML Editors (like Microsoft's Frontpage or Dreamweaver) that provide all the preformated codes for you... BELIEVE ME when you learn how to build from the "ground up" by Hand Coding, you'll be far ahead of others who choose those blog builders or HTML Editors or Facebook, Twitter or Myspace host builders... or even WordPress ...that are offered elsewhere... where you "click buttons" and presto, your page is built for you... BUT YOU LEARNED NOTHING ABOUT IT! and of course you'll spend NO MONEY here!!! (except perhaps if you later want to use a Pay Web Host, and/or if you want to purchase your own Domain Name ... these options will be available at anytime, but are absolutely not necessary to get started here...) And of course, you'll SAVE HUNDREDS of $$$ by not paying a Web Design Firm to build your site! You need to get a Paper Notebook of sorts and jot down notes and info as you go along... it's really a bit like going to school... if you are Serious About This... so just BOOKMARK this web site and go thru ALL of the Design Series pages... take your time, take notes and come back and study and learn daily... and before long you'll be really "cookin" with Web Design... I promise! To "see" a source code, for example, for THIS PAGE (that you are currently viewing), all you have to do is RIGHT CLICK ON AN OPEN PLACE ON THIS (or any) WEB PAGE... then choose "View Source" from the small window that opens up... you will then get another window that opens from your PC default text editor, and all the HTML Coding, that was built to construct this web page, will be shown to you! Try it now! WATCH OUR: View Source Media Tutorial Movie takes a minute to load... player controls are at bottom! You should learn HTML at W3Schools ...We STRONGLY RECOMMEND that you read and use Our Recommended Design Sites above others that you may find on the web! Our Policy is to direct you to the BEST existing online sources for Learning HTML... rather than try to teach it to you here at our site! Next ...you need to select and sign-up with an Online Web Host which will provide you with the actual webspace and Online Web Server where you will store and serve your web page documents from (to users who want to access your web pages from their PC's)... You could use YOUR COMPUTER as a Web Host but it would have to be turned 'on' all the time and would have to be totally reliable... so forget it, use a real Web Host! Find A Host Here with all the features that you want, however we recommend Aplus.Net ... very reliable, fast and low-cost! So in the end, your web page now has a location and address on the Internet... and still also has it's file stored on YOUR PC. Both the Internet file and yours on your PC text editor are written in HTML and other Codes and are the SAME Identically! 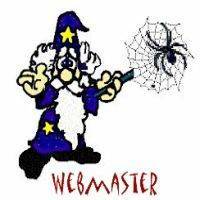 So this is how you become a Webmaster for your webpage! Now you can Design more pages on your subject and link them all together using HTML... and create a real WEBSITE!